With Asia-Pacific Economic Cooperation (APEC) fast approaching, people in Manila can feel the preparation of the Philippine government. To ease the usual traffic congestion, alternative routes are created and classes in Metro Manila will be suspended from November 17 until 20. Commission on Higher Education had recently issued the scheduled class suspensions for the APEC meet being hosted by the country this year. CHED-National Capital Region (NCR) Director Leonida Calagui stated that a memorandum is already issued to the heads and presidents of both public and private universities and colleges in Metro Manila. Since November 17 to 20 are school days, classes are suspended to ease the traffic congestion usually felt in the metro. On August 10, 2015, NCR Department of Education (DepEd) director Luz Almeda said in a memorandum that the classes are also suspended for safety reasons. Aside from the classes being suspended to help ease the traffic problems, Malacañang declared November 18 and 19 as special non-working days in NCR. Public sectors will also have November 17 and 20 as non working days. On the other hand, since the regular days of classes are suspended due to the APEC Economic Leaders' Meeting, the schools divisions are tasked to make a schedule for make up classes as stated by Almeda. 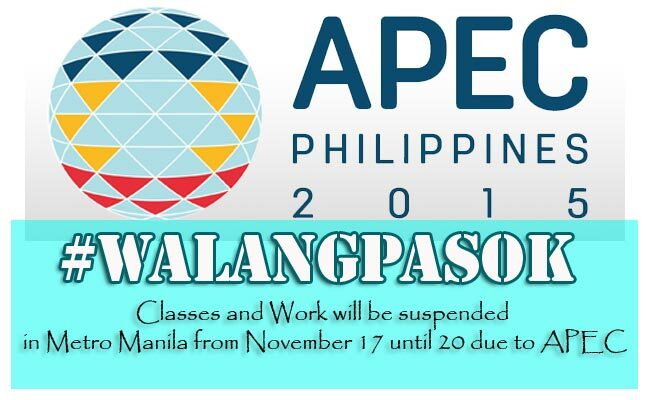 The schools are encouraged to include the APEC’s benefits and importance in the Araling Panlipunan lessons. While the memorandums had suspended 4 days of classes, the principals are reminded that they must still comply with 201 school days requirement for school year 2015-2016. Calagui also stated that the institutions under the higher education in NCR are also encouraged to give alternative assignments and activities to their students to keep them busy and keep them off the roads on the said dates. Based on Proclamation No 1072, s 2015, private sectors will also have non working holidays on November 18 and 19.